Everyone would like to find a simple reason for why they are losing their hair. There are many hair loss myths. Sports lovers tend to think that wearing a hat too much will cause hair loss. Women who wear wigs will assume that additional thinning is from the wig itself. Even the latest hairstyles that involve teasing, weaving or straightening have been blamed. Although any of these things could possibly cause some temporary loss of hair due to rubbing or close contact with the scalp, permanent hair loss is not usually a result of any of these things. Another myth is that by stimulating the scalp with massagers or lasers you can grow full, natural hair. Some studies have shown that it is possible to re-grow some hair with the use of laser combs or scalp massagers but the results were mainly fine, delicate hair, something akin to peach fuzz. A myth that is even more recent is that Rogaine and Proscar are the only way to grow new hair and keep your existing hair. While it is true that those medications can help in the fight with hair loss they are not the only answer. Keep in mind that not everyone will tolerate these medications (be sure to review any possible side effects) and if they do the hair loss will return if these medications are ever stopped. As a matter of fact, most people tend to loose all of the hair that they would have lost during the time they took the medications within a a 2-3 month period. One fact remains, surgical hair transplantation is the safest, most affordable and permanent solution to your hair loss. 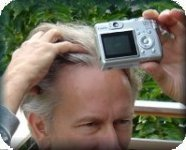 This entry was posted in Hair Loss on October 25, 2009 by Larry Shapiro.